I hope you all had a fun weekend! I know some of y'all up North had some cold temps but it was beautiful here so we ditched the to-do list to hit up a local festival and wander around downtown Charleston. We over-indulged in sweets... including a red velvet oreo brownie (!!) and a funnel cake at the festival. We also thought it was high time Rowan tasted his first gelato so we couldn't pass that up before letting him run around the waterfront. As a result of my serious lack of self control within 20 yards of sweets, I'm dreading shorts weather this year. 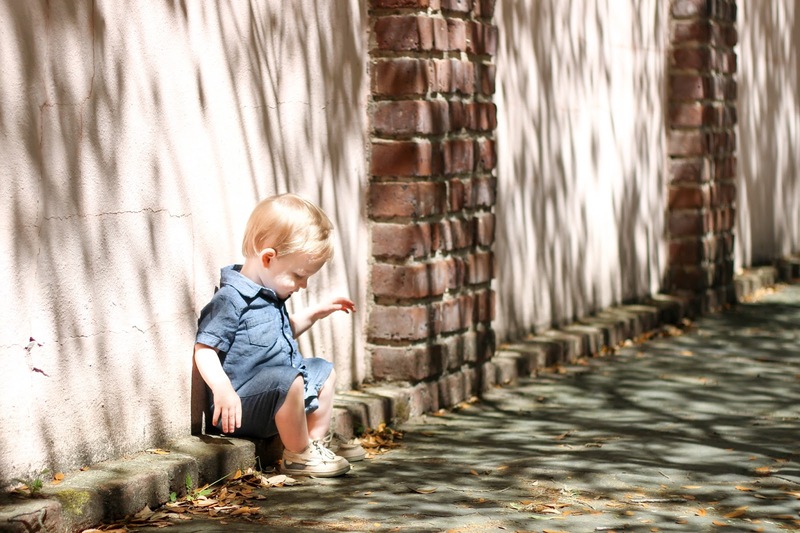 Last year I used the excuse of recently birthing a child for my unsightly legs. But that isn't going to fly this year. Even if I wasn't a mom, nearing my 30s and the date of my last gym appearance call for something other than a teeny tiny inseam. Also I'm currently on stage 3 of the Mom Bod process, just in case you're wondering. In an effort to hide as much of my pale mom legs as possible without sweating it out in the Charleston humidity, behold... my favorite mom-bod approved shorts. Loft Chambray Sailor Shorts (also love these but haven't tried them on yet). Loft Denim Shorts. J. Crew Factory White Denim. J. Crew Factory Pull On Shorts. Old Navy Linen Shorts (these will wrinkle because they are linen but for the $ and comfort, they work for me. I also love this version in red). 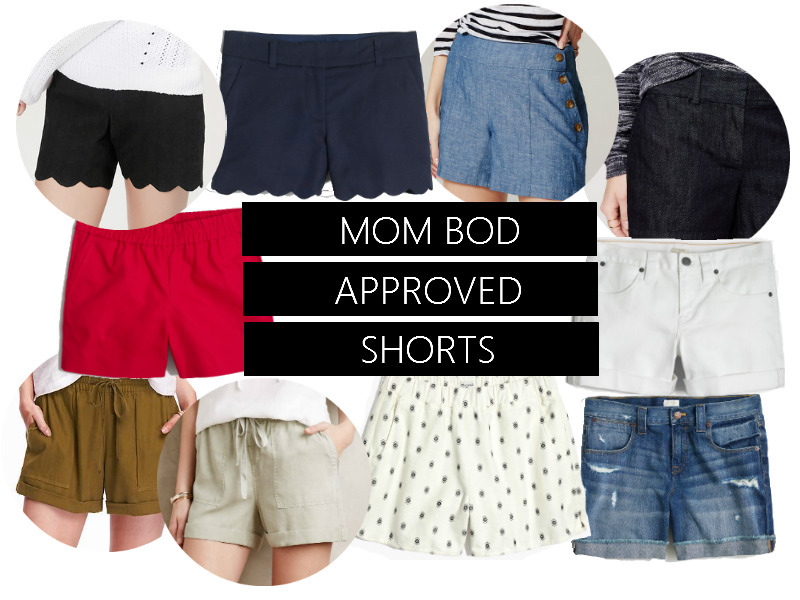 So what qualifies as mom-bod approved shorts, you may ask? One. I aim for a 4 inch inseam because no one wants to see this mama chasing a toddler around in anything shorter. And before you think I'm crazy, longer inseams do not equal bermuda shorts! I'm tall so a 5 inch inseam works for me, especially with these pull-on shorts. Two. Anything that needs ironed is a joke. Three. Stretchy waistbands get major bonus points. I either own every one of these shorts or I've tried them on in store and I'm currently waiting for a sale to bring them home with me. My faves that have lasted several summers are the pull-on shorts (the best ever), dark denim shorts, and the white denim shorts. In general, Loft and J. Crew Factory always work for me because they offer so many different inseams. Anyone else a fan?! Share some of your faves if I'm missing them! Oh, those scalloped shorts! Great options! I've always been a 3" inseam kind of gal...If I don't schedule my workouts they don't happen! You got this. The JCrew stretchy waist band shorts are my FAVORITE. Life is 100x easier with those in the summer! The scalloped shorts are perfection!!! I have lots of Jcrew shorts from past years, but recently started loving loft shorts. I prefer the 6 inch seams, but it's a little annoying that those are only available online. Ooooh great suggestions! I need some mom shorts!